Tsubaki engineers have spent five decades designing and improving upon unidirectional and mechanical clutches to enhance their reliability and performance. The result is Tsubaki’s line of Cam Clutch solutions, complete with innovative features to ensure reliable operation in harsh environments. In backstopping applications, clutches are used to prevent reverse rotation of drive shafts, which may cause damage to expensive machinery and equipment. Tsubaki pioneered the non-rollover design in its clutches, which means that even if an unexpectedly large reverse torque occurs, the clutches will not roll over. Typical backstop applications are in conveyor systems and gear reducers. The company carries several lines of clutches designed for backstopping applications, including its BR-HT Series, BREU Series, BS/BS-HS Series, BSEU Series and TXT/CA Series. 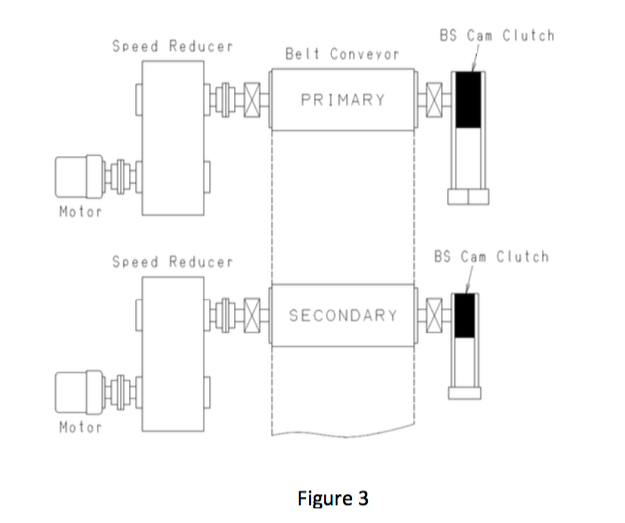 In indexing applications, reciprocating motion applied to the clutch transforms into one-direction motion. A crank mechanism on Tsubaki’s design provides reciprocating motion to drive the Cam Clutch, which then drives in the forward stroke and overruns on the return stroke, indexing the feeding roller forward. Tsubaki carries several solutions for indexing applications, including its MIUS Series, MZ Series and MZEU Series. In overrunning applications, the clutches spin freely the majority of the time, though they are sometimes required to lock up and drive. Typical applications include a two-speed drive, where the machine is driven by either an electric motor or geared motor. When the gear motor drives at low speed, the clutch engages. At higher speeds, the clutch overruns, automatically switching between low and high speeds. The company’s portfolio of Overrunning Cam Clutches includes its BB Series, BUS 200 Series, MGUS/R Series, OB-ON/OF Series, OB-SF Series, PBUS Series, TFS Series and TSS Series. 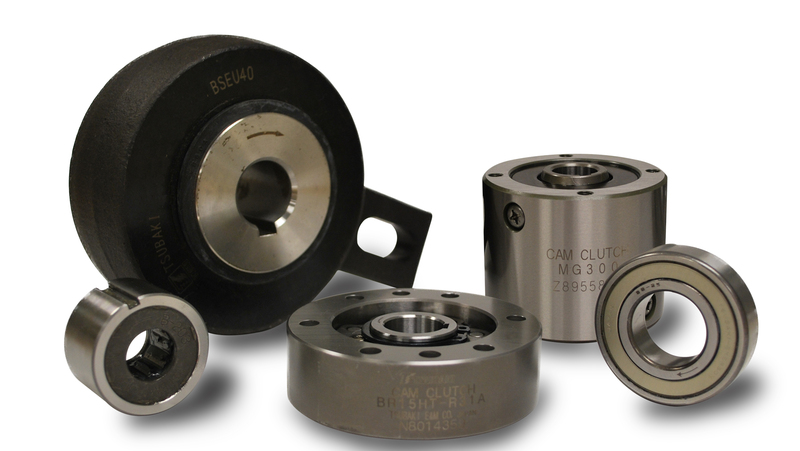 All Cam Clutch products from Tsubaki are available in a variety of bore sizes and torque capacities for each application’s unique needs. The customer’s waste-to-energy plant facility provides dependable, environmentally safe disposal of municipal solid waste for 290,000 residents, while generating clean, renewable electricity for sale to the local utility. The conveyor that transports fly ash (by-product from the incinerated residential and commercial waste) was having trouble with the competitor’s backstop on the head shaft, where the unit was leaking oil. There was a concern it would fail without notice and cause an unplanned stop to the operation. Tsubaki engineering reviewed the application, confirmed the motor horsepower and conveyor speed and recommended our BS160HS with the I-beam torque arm. Because of the need to avoid a sudden breakdown, the key factor was the speed of delivery – the product was received after 9 days of drawing approval and installed as a drop in and has been operating smoothly. The customer avoided a potential downtime situation. Backstops are most commonly used to prevent reverse rotation of an inclined or vertical conveyor systems. Many configurations of conveyor systems that employ backstops are available. Most common types and calculation examples will be presented in this article to properly size the backstop in order to maximize performance and improve safety of the conveyor. 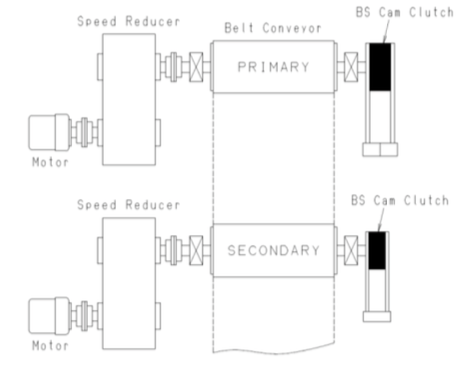 For low speed overrunning applications, backstops are installed directly on the extended head shaft, as shown in Figure 1 and 2. Tsubaki recommends single installation of the backstop to prevent reverse rotation of head shaft. 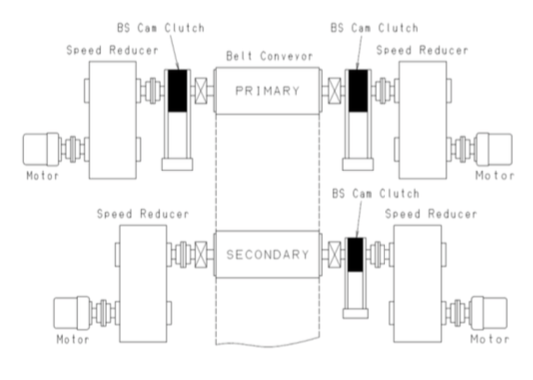 When the conveyor arrangement calls for a primary and secondary drive, as shown in Figure 3, the Backstop on the primary drive unit holds the full load. The Backstop on the secondary drive unit holds the back tension from the belt keeping belt traction on both conveyor systems. Tsubaki recommends that the Backstop have the torque capacity that is equal to the sum of the primary and secondary motors be installed on the primary unit drive. The Backstop on the secondary drive unit should be sized from the secondary drive motor only. Backstops by definition are required to hold back a load from moving in a reverse direction. Care must be taken in calculating the torque requirements and should be based on maximum or worst case conditions and not average/normal loads. Because any failure of a backstop might result in costly damages or injuries, care must be exercised by considering all the possible loads and in turn selecting appropriate service factors. The Backstop needs to be sized for the breakdown or stalled torque of the drive motors. The following table shows typical service factors that should be applied when sizing for backstops. Backstops have no backlash, therefore, two backstops can theoretically share 50% of the total calculated torque. However, we have to consider “load sharing factors”. NOTE: In this usage, load sharing factor becomes 1.7 for two Backstop Cam Clutches, not 2. 125 HP x 5250 x 1.67 SF / 43.75 RPM = 25,050 ft. lbs. Torque capacity BS160HS = 28,912 ft. lbs. > 25,050 ft. lbs. 2 x 400 HP x 5250 x 1.33 SF / 29.17 RPM = 191, 498 ft. lbs. Torque capacity of BS300HS = 216,843 ft. lbs. > 191,498 ft. lbs. 2 x 1000 HP x 5250 x 1.33 SF / 31.82 RPM = 438,875 ft. lbs. Correction torque = 438,875 / 1.7 = 258,162 ft. lbs. Torque capacity of BS350HS = 289,124 ft. lbs. > 258,162 ft. lbs. 2 x 750 HP x 5250 x 1.33 SF / 38.89 RPM = 269,317 ft. lbs. Torque capacity of BS350HS = 289,124 ft. lbs. > 269,317 ft. lbs. 750 HP x 5250 x 1.33 SF / 38.89 RPM = 134, 658 ft. lbs. Torque capacity of BS270HS = 150,462 ft. lbs. > 134,658 ft. lbs. 4 x 1500 HP x 5250 x 1.17 SF / 35 RPM = 1,053,000 ft. lbs. Correction torque = 1,053,000 / 1.7 = 619,412 ft. lbs. Torque capacity of BS450HS = 722,809 ft. lbs. > 619,412 ft. lbs. 2 x1500 HP x 5250 x 1.17 SF / 35 RPM = 526,500 ft. lbs. Torque capacity of BS425HS = 542,107 ft. lbs. > 526,500 ft. lbs.